This past weekend was a special one for Chance The Rapper and his fiancee, Kirsten Corley, as the couple rounded up their family and friends for an intimate engagement party. After popping the question to Kirsten in July at a family BBQ, asking her to make him "a man and be my wife," Kirsten has been sporting her lovely diamond ring and the wedding day is getting even closer. 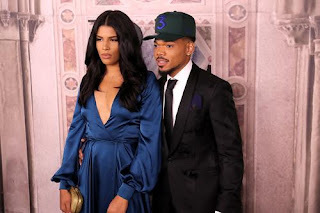 Chance shared a series of photos to Instagram that sees the delicious menu offering for guests, intimate and candid shots of family, his brother Taylor Bennett and his partner, who is pregnant with their first child, and a cute chocolate vinyl that reads "For The Record I Love You." "From the beginning beginning to the end end. You are my oldest and best friend. You are responsible for everyone of the most wonderful things in my life," Chance said of his love on her birthday this year. "I’m forever grateful that God made me find you, and even more grateful that you made me find God. Forever and ever babe. Happy Birthday."